When I wrote about When Athletes Hit a Plateau – Change Distance or Change Training?, the thought of converting a 400 meter sprinter to a 400 meter hurdler was an option. I had that dilemma when I first started running 400 meters, because I wasn’t born with blazing fast speed. For the 400 meter hurdler, you have to look for characteristics such as good flexibility and coordination (i.e. hip mobility), good strength endurance, and someone who loves over-distance training and racing, such as the running the 600 meters. If they fear the 2 x 500m (or 3 x 500m) in practice, then you can forgetaboutit. I will probably get a lot of flame mail or comments, but I find the 400 meter hurdles easier compared to the 400 meters flat because you have to count steps, thus you can divide the race into 11 parts as opposed to 4 in a flat 400 meters. Some guys count every step, some count alternate steps (i.e. for 15 steps between hurdles, 2, 4, 6, 8, 10, 12, 14, KICK! ), and some guys just don’t worry about it. You will need to have good spatial judgment and be able to lead with alternate legs if you choose the latter. My rule of thumb for calculating potential is take your best 400 meter flat time and add 5 seconds. A 50 sec 400m open sprinter can run 55 seconds for the 400mH after 2 years of hurdle training. The biggest technical problem with newbie hurdlers is they spend too much time in the air over the hurdles. You have to get that lead leg back down after you clear the hurdle! The second problem is they give too much clearance over the hurdles, which adds to flight time. READ How fast do CrossFit'ers run 400m? For elite athletes, it’s a whole different ball game. 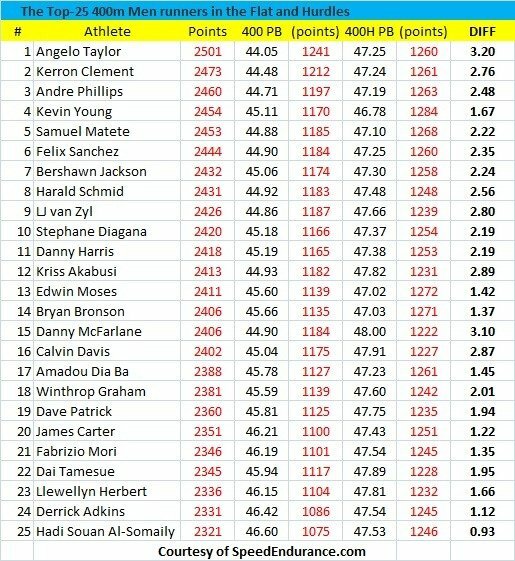 Take a look at the chart below and you can see 1.50 to 3.00 seconds the norm for elite male athletes. David Hemery, born UK 1944, must be on the list somewhere. Silver 4x400m relay Olympics 1972-couldn’t find a split time but must be <47 I would guess. I could not find a 400m flat PR. 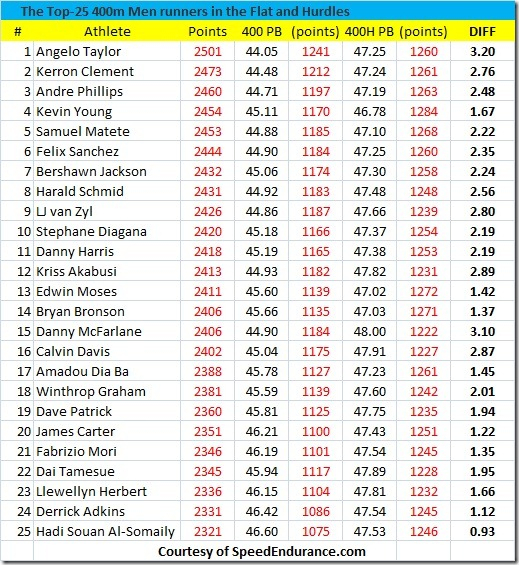 David Hemery was originally a 110mH (120yH)…a good case of moving up in distance. Hey, I didn’t see John Akii-Bua on the list. Don’t forget about it! Munich ’72. That statement is incorrect for 400 hurdles. 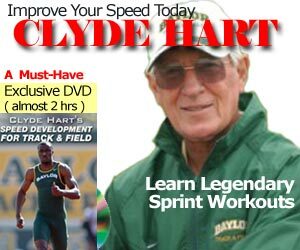 Actually you don’t want a 400 hurdler to focus too much on getting the lead leg down quickly. Just keep the momentum going and not loose any speed. Being too aggressive on top of the hurdle can be a bad thing for a 400 hurdler. Sometime you look at a elite 400 hurdle race and they hurdling is terrible especially the last 2 hurdles. But all that does not matter, because what an elite hurdler does is keep the rhythm going and does not loose any speed in either side of the hurdle. So here are some of the reasons usually between a newbie and elite hurdler regarding the time difference. – The time lost for a newbie hurdler is not getting the rhythm right. They might take too many strides (shuffle) before going over the hurdle or overstride to reach the hurdle. Both are detremental to your performance. So imagine running a 400 meter flat race and slowing and increasing your pace every 35 meters. – A newbie hurdler might run too fast the first part of the race. Pace judgement. – Confidence to hurdle leading with both legs. Elite hurdlers are good at attacking the hurlde even in later part of the race. @Rajeev, you are absolutely correct with those points, I was referring only to technical “hurdling” itself, but, as you mentioned, race execution is a whole other matter. We don’t run the 400 Meters in High School, however I like some information on how to predict a 300 Meter Hurdle time using a flat 400 Meter time. I’ve been to many clinics and heard many different thoughts on the discussion of whether or not to count steps. This is the theory that I’ve come up with, but would love to get some debate going on the issue because I don’t really think there’s a wrong way, but there’s definitely different great ideas on the best way. In the 400 hurdles, I don’t give my athletes a set step count, I give them a target range but train them to be comfortable enough with steering to navigate the hurdle as it comes up. In practice we spend a fair amount of technical training time working on switch leg hurdling with randomly spaced hurdles to accomplish this. The reason I came up with this strategy is because I found that my hurdlers did better adjusting to varying race conditions (wind, rain, cold, tightness from other races, etc.) when they didn’t feel constricted by set stride patterns. In the beginning of my career, we struggled a lot with athletes either fatiguing, or accelerating during the race, causing them to bunch steps, or over-stride to reach the hurdle. Over time with those hurdlers, we were eventually able to get fluid stride patterns, but the race never really developed the way we wanted it to. By not focusing on stride patterns, but good navigation into the hurdles, they seemed to pick up the technical hurdling much quicker and run more aggressive splits. Does anybody reading this use set stride patterns? Does anybody use variable stride patterns during different segments of the race, or any other race strategies they’d like to share and why? Great article, thanks for the post! I believe the variable stride pattern was introduced by the Brit Malcolm Arnold who made his star pupil John Akii-Bua hurdle with both legs, but I think, not 100% sure of this, that John used 13 steps for the first 3-5 hurdles, but then had to go ‘down’ to 14-15 steps. MA himself or Ralph Mann know the truth anyway so I’d better not be guessing. I love charts like this, but do you have one for women? I am coaching a good 400m runner who I think could end up being a very good 400m hurdler. Also, do you have a chart with 100m split times for female 400m runners? I haven’t been able to find one for females. Thanks!